Exclusive to The Golfing Store in Asia! The Perfect Golfing Gift. This exquisite artwork is 95cm x 65cm (c.38" x 26"), image size 80cm x 48cm (c.32" x 19"), and is a giclee print on archival paper. Each luxury print comes with an information key to the personalities in the painting. Perhaps the most famous golf painting in the world - and certainly the one with the longest title - is "The Golfers: A Grand Match Played over the Links of St Andrews on the Day of the Annual Meeting of the Royal and Ancient Golf Club" by Charles Lees (1800 - 1880). The original was acquired for around HK$25mm in 2002. The scene is set at the 'Ginger Beer Hole' on the Old Course at St Andrews during the October meeting. It was painted during the years 1846 and 1847 and shows a two ball foursome in which Sir David Baird and Sir Ralph Anstruther challenged Major Hugh Lyon Playfair and John Campbell of Glen Saddell. 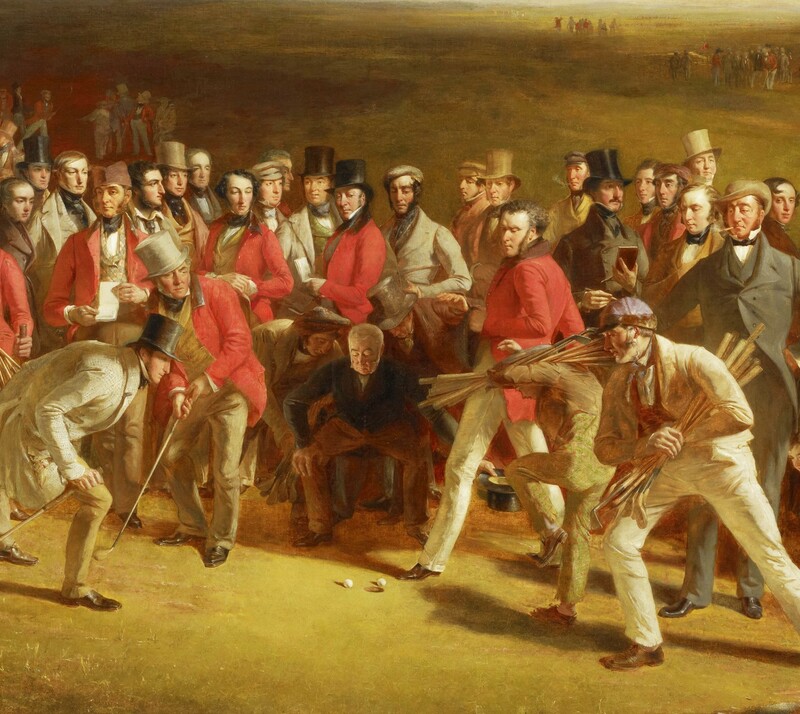 The painting captures the essence of golf and shows many of the leading players of the mid-nineteenth century, a time when the game was still almost exclusively Scottish. Above all, Lees has caught that agonising moment familiar to all golfers, whether in 1847 or today - will Playfair’s ball drop into the hole? We will never know the answer, but we do know that we are looking at a great picture. The artist, Charles Lees, was born in 1800 in Cupar, ten miles west of St Andrews. He studied under Sir Henry Raeburn, Scotland’s leading portrait painter of the day, becoming a noted portrait painter himself and a specialist in painting sporting subjects.